CAMBRIDGE — The ads began popping up this spring. The poster and radio spots appear to be public service messages about a liver-destroying virus few are aware of. But if you look or listen carefully, you’ll notice the name of the sponsor — Cambridge biotechnology company Vertex Pharmaceuticals Inc., which recently won federal approval to sell a new hepatitis C drug. Its pill, being sold under the brand name Incivek (pronounced inn-see-veck), is expected to quickly become the biggest selling drug from a Massachusetts company in nearly a decade, with annual sales projected to hit $2 billion within three years. But rather than drum up consumer interest in the product itself, Vertex is conducting a so-called unbranded campaign that doesn’t mention Incivek. 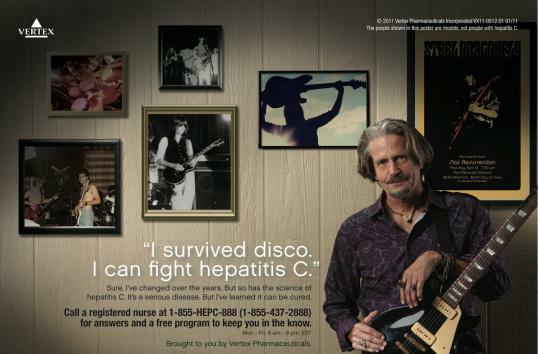 The idea, company officials say, is to let more people know about hepatitis C.
Educating the public about the disease also is a priority for pharmaceutical giant Merck & Co., which is selling a hepatitis C drug to compete with Vertex’s and has enlisted legendary rocker Gregg Allman for a similar awareness campaign. The two companies are promoting information about the illness over their brand-name medicines — at least for now — because many of the 3.2 million Americans believed to carry the virus don’t realize they are infected, according to numbers from the Centers for Disease Control and Prevention in Atlanta. “Three quarters of the people don’t know they have the disease, and most of the people who know don’t get treated,’’ said Pamela Stephenson, Vertex’s vice president for marketing excellence. Untreated, hepatitis C can eventually cause cancer or liver scarring, and about 10,000 people die from the disease every year in the United States. Many of those at risk are baby boomers who contracted the virus through intravenous drug use or blood transfusions in the 1960s or 1970s, before the blood supply was safeguarded, and have lived for decades without symptoms. Incivek is the first drug the 22-year-old Vertex brought to market and sold on its own. While the pill is positioned to become a major success for the company — which last week broke ground for a massive corporate headquarters on the South Boston Waterfront — it will compete with a Merck’s drug, which won Food and Drug Administration approval 10 days before Incivek last month. Both treatments work by blocking the enzyme that allows the hepatitis C virus to replicate. Though Merck’s drug got out of the gate first, Vertex’s did better in clinical trials and is projected to win a larger market share. The decision to forgo a purple-pill-style marketing blitz in favor of a campaign focused squarely on hepatitis C is somewhat unusual. While drug makers have used unbranded campaigns in the past, it’s typically done when they are first to market with a treatment and don’t have to worry about a rival product. By contrast, drugs for hepatitis C have been around for years, though the new class of drugs — used with existing therapies — promises a more effective treatment with shorter duration. Vertex ads direct consumers to a website, www.bettertoknowc.com, and a free nurses helpline, 1-855-HEPCINFO, where they can learn more about the virus and treatments. But the focus of the ads is squarely on introducing hepatitis C to the public. Merck, based in Whitehouse Station, N.J., also has launched a consumer awareness website, www.allabouthepc.com. Like Vertex, Merck does not directly promote its new product, Victrelis, but urges consumers to get more information about the disease and consult doctors or nurses. Merck has also teamed with Allman, who was infected with hepatitis C and received a liver transplant. The Allman Brothers Band will perform a World Hepatitis Day benefit concert in New York on July 27. Though the companies have not collaborated, by increasing the pool of people seeking treatment, both will benefit. Merck and Vertex also run parallel campaigns to educate doctors and nurses about their products. Another push to educate the public about hepatitis C is being readied by the CDC, which is writing new guidelines that will recommend one-time screenings of people born between 1946 and 1964. Currently, people are tested for hepatitis C only if they are considered high risk. Given that about 3 percent of that age group — one out of 33 people — is thought to be infected, broader screening makes sense, said Dr. John W. Ward, director of the CDC’s division of viral hepatitis. “These people are aging into a risk period for this disease,’’ he said.